The Chapelco Golf Resort was the first course in South America designed by Jack Nicklaus and his son. Surrounded by a unique landscape blending nature with the majestic view of the Andes mountain range. Chapelco was built to the USGA standards which included a necessary underground infrastructure making the course playable most of the year. Chapelco is a prestigious and residential golf development located a few miles from San Martin de los Andes in Patagonia. This real estate resort consists of 430 residential lots including a 5-star world-class hotel. La cancha de Chapelco Golf & Resort se trata de la primer cancha de Sudamérica co-diseñada por Jack Nicklaus y su hijo Jack Nicklaus II. Rodeada de un entorno único, en absoluta comunicación con la naturaleza y con una majestuosa vista a la Cordillera de los Andes. Este campo diseñado bajo normas USGA cuenta con la infraestructura subterránea necesaria para garantizar su juego durante la mayor parte del año. Los 5 set de tees de salida de cada hoyo le darán la posibilidad de disfrutar de una de las mejores canchas de Sudamérica a jugadores de todos los niveles. In Volume 2 of The Confidential Guide to Golf Courses by Tom Doak, Ran Morrissett, Masa Nishijima and Darius Oliver, the authors have this to say about the course: The centerpiece of a large development in the valley below San Martin, Chapelco is a solid design on fairly gentle terrain, in excellent firm and fast condition. The strong winds in the valley probably justify going gentle with the design... but the course has few holes that will get your blood pumping... the best of them was was the par-5 10th with its fairway swinging right and then left around bunkers. One morning last Summer, I sat looking at the World Map in my kitchen whilst browsing random countries on this website. I wondered what the Golf is like in Uganda? Is there Golf in Nova Scotia? You get the picture. Suddenly I find myself scrolling through Argentina. That looks good. And that one, Hmmm, this one looks REALLY good. And that one too. Then I hit Chapelco. It looked mythical. Other worldly. I went back to my map. I surmised that to play here would be quite a challenge and resolved to build a trip around reaching Chapelco. In reality, it was easier to reach here than I had supposed. It can be done with an easy over night flight to BA. A stop for a day to play any one of the fine courses in BA, Dine at Cabrera Steak House and then hop on a plane for a couple of hours next morning and you will be here. In the Andes. Golfing, Fishing, Cycling, rafting or biking. Whatever takes your fancy. It is all World class and unheralded. I can’t recommend it highly enough. Whilst I was here a Bunch of bikers touring the Andes stayed the night. Parking Harley’s, Choppers and Gold Wings out the front of the hotel. My room overlooked the 18th and 9th holes, the clubhouse and 2000 m Peaks beyond. I woke up in the morning in the Loi Suites Hotel, put on my golf shoes and took my clubs to breakfast. I stayed here for 4 magical days to explore El Desafio GC, Chapleco GC and St Martin De Los Andes. Jack has routed the course. Two separate returning loops are draped over undulating walkable ground in a valley framed by majestic snow caped peaks and through mature pine forest. Each hole enjoys its own setting. Jack’s Shaper enjoyed this place so much he bought a plot and built his house here. I can see why. Each hole is quite different. There are plenty of tees to chose from and some lovely lakes to negotiate. The pictures say it best. Jack builds courses that are reliable and enjoyable. He doesn’t do risky, controversial or hysterical. His courses are fastidiously designed in every way. Especially around the green sites, where the run off areas, slopes and bunkering all are purposefully shaped to be tricky but fair. The conditioning was terrific from tee to green. You can bomb the ball here or thread it. Some lovely par 3’s, challenging par 4’s and Epic, swash buckling Par 5’s await. The camera came out an awful lot here. The gambling stream tumbling through the early holes of the front nine. The beautiful never-ending views from the tees. The wildlife and setting are all to die for. The memory of this trip is still new but already I know it is a lifelong companion. I think the best hole for me would be the fourth. I liked the choice of two fairways to attack, although the benefit of going for the thin slither to the right, that cuts through the scrub and waste bunkering, probably is not worth the risk as it only brings you a couple of clubs closer to the green. Nice to be offered the possibility none the less. Yes, I did have a go. No, I didn’t make it. Perhaps they could make the tee shot on the par 5 Sixth more interesting by raising the tee and bringing in the stream down the left? Maybe a bunker on the corner of the dog leg going down to the stream? If you drop that corner you might glimpse the green too? What do you say Jack? There is plenty of room here. The Grand scale of everything makes it eminently playable whatever your standard. Just choose the right tee. Jack has laid down another classic lay out. Thrilling from the start to the finish and recognisable to all of you the minute you arrive. Thanks to Javier of Wegolfargentina (peerless), Mariano and Arnan of Chapelco for showing me around and looking after me so well. Memories for a lifetime. Oh, you Have to have the Chorizo de Bife in the Clubhhouse. (A Massive Sirloin Steak) Now, Where to next? Danang? Chapelco Golf is in one of the most beautiful areas in Patagonia. 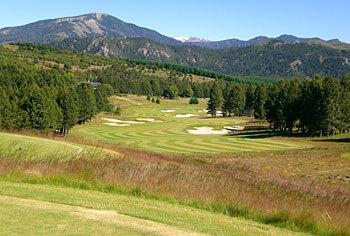 The golf course sits in a valley with beautiful views of the surrounding mountains and the Chapelco Range. The opening 4 holes are relatively tight and difficult. A well placed tee shot is crucial on these holes and hybrids or even iron shots should be considered. The rest of the holes are wider and offer more strategic considerations with the tee shots. The greens are relatively small and with lots of slope. Conditioning was very good in early January 2015. Play at Chapelco was lots of fun and the golf course is one of the best in Argentina. San Martin de los Andes is a must visit town for golfers in Argentina, with 2 excellent golf courses witin 5 minutes of each other. Played 5 rounds this weekend in what is for most the best course in South America. The landscape of the place where the course is placed is simply the best you can imagine, sorrounded by snowy mountains and cristal clear water. Chapelco is very challenging, every mistake will be punished. Excellently kept, very tough greens but more than anything, a great design. A lot of earth movement was done and it shows, some tees will take your breath. My favourite? By far par 3 7th, a breath taking view from tee and a great green. But every hole has something special. This course is a must and its fame will grow a lot in the next years. Yes, this is a great course. Played in March of '09 and it was in superb condition. The wind was challenging but the course was outstanding!